Here we go again with Primal Kitchen. I am surely obsessed with using these marinades for my meals. I used the Honey Mustard Vinaigrette once again last night but this time I marinated some pork chops. 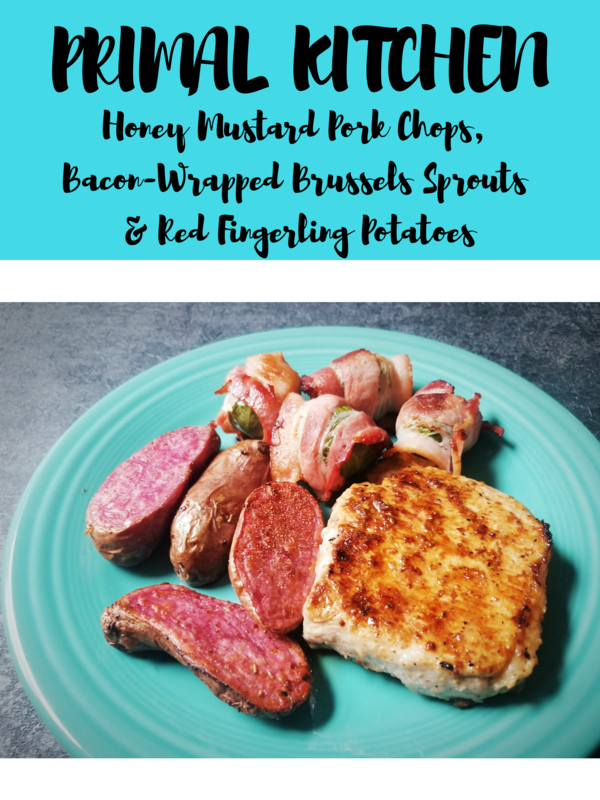 The Honey Mustard, to me, is one of the most versatile in the line of Primal Kitchen, alongside the Balsamic Vinaigrette.Â We also had some thick cut slices of honey bacon from Dearborn Brand to wrap our brussels sprouts up with. And as requested by my daughter, we had to have some more air-fryerÂ red fingerling potatoes, which are her favorite side dish at the moment. You add up all of these ingredients and it results in one hell of a delicious paleo, primal Honey Mustard Pork Chop dinner! This is where the fun all begins, with the Primal Kitchen Honey MustardÂ Vinaigrette & Marinade. I had two decently sized center cut Simple Truth pork chops to work with. I grabbed myself a Pyrex casserole dish and marinating the pork chops from early morning to dinner time. That was plenty of time to infuse them with the sweet and tangy honey mustard flavor that we all know and love so much! I was so excited for thisÂ Honey Mustard Pork Chops and I could not wait until dinner time rolled around. The cast iron grill pan was used for these Honey Mustard Pork Chops, of course! How else would I cook up a hunk of meat? I rave so much about this grill pan, I know, but I really hope it inspires someone out there to give it a whirl. It is the best method for cooking several different types of meat. I think of it as a kitchen necessity! I cashed in some coins that I had laying around and got some dough at a coin shop this past weekend, for real! I had some coins and figured I would be better off going on one of my fun foodie adventures at Nino Salvaggio’s. A girl’s gotta do what a girl’s gotta do to get the good eats, am I right? So we went to Nino’s and loaded our little cart some new-to-us foods. I spotted the Dearborn Brand Honey Bacon. I scoffed at the $6.99 price tag, but that bacon sure was looking and sounding good. I had to have it so in it went right into my cart.Â You mention bacon to my husband and my daughter and they are all ears! I got this particular honey bacon because I knew it would be the perfect bacon for myÂ Honey Mustard Pork Chops side dish. What I ended up doing was taking five strips of bacon and cut them in half. I looked for the big brussels sprouts and wrapped ten of those up in the Dearborn Brand Honey Bacon. I roasted them in the 400-degree oven for 30 minutes and flipped them halfway through roasting. The bacon had the right amount of crispness for us. We don’t like bacon underdone or overdone, it has to be in the middle… just perfect! Chloe, my daughter, always clamors for potatoes. It does not matter what kind of potato it is but she wants her potatoes at dinner time. Our favorite at the moment is fingerling potatoes. Chloe prefers when I slice them in half and then she eats them like fries and dunks them in ketchup. I don’t do that but my husband and she does. With this batch of fingerling potatoes I did slice them in half and instead of using olive oil on them, I used what was the leftover of my Primal Kitchen Honey Mustard. What a great idea that was. I have never had honey mustard potatoes but that marinade sure turned out to be an excellent choice for myÂ Honey Mustard Pork Chops. These went in my air-fryer at 385-degrees for about 15 minutes. Every kitchen needs an air-fryer for cooking potatoes. It is my favorite method currently. The texture of the potato skins on these potatoes is spot-on and exactly how I want them to be. Have you ever tried any Primal Kitchen products? Which one is your favorite? Did you know that with my special coupon code GIVEITAWHIRL10 you can save $$ at Primal Kitchen? Why not give it a whirl today? I say go for it! This entry was posted in My Cooking Journey and tagged air fryer, bacon, brussels sprouts, cast iron, cooking, coupon, dinner, discount, fingerling potatoes, grill pan, healthy dinner, healthy food, honey mustard, marinade, organic, paleo dinner, paleo food, Pork chops, potatoes, primal eating, primal kitchen. Bookmark the permalink. Hope you love it. I am a big big fan of all of their products! Sounds delicious, especially with the mustard! I don’t have an air fryer but have been considering asking for one for the holidays! Ooooo get yourself an air-fryer. They are perfect for potatoes! Oh my, this is perfect because I’m planning of getting an air-fryer. I will make this meal for sure!